A Southwest Airlines Boeing 737 MAX 8 aircraft made an emergency landing at Orlando International Airport after an engine malfunction, the FAA has said. The jet was on its way to be grounded in wake of the deadly MAX 8 crashes. 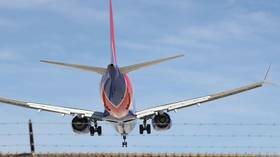 The pilots followed protocol and there were no injuries, according to Southwest spokesman Dan Landson, who said the plane would be taken to the airline’s Orlando maintenance facility for further examination. In the aftermath of the two tragedies, the spotlight has fallen on the FAA, which reportedly allowed Boeing to conduct its own “flawed” safety analysis of the jet. The FAA trusted Boeing’s conclusions, which a team of insiders claim were carried out without proper care, in an attempt to bring the plane to market before rival Airbus launched their own similar jetliner.